by Sentinel Connector Systems, Inc.
Our Sentinel Cat6 Modular Connectors - RJ45 - 100 pack are the perfect for building custom length CAT6 network cables. Our modular CAT6 connectors are manufactured from a clear poly-carbonate and built to withstand everyday abuse. 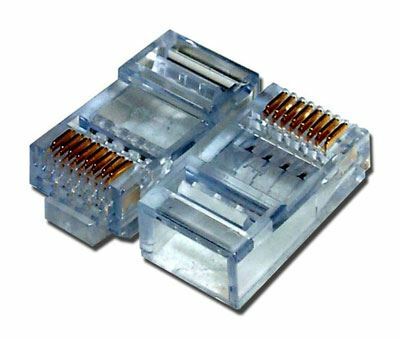 With our quality CAT6 Connectors you can expect error free data transfer. Staggered connectors help maintain data integrity and cut down on cross-talk by using a One Up, One Down style that keeps the conductors seperate and maintains the recommended twist throughout the connector. Manufacturer Sentinel Connector Systems, Inc. I usually use the Sentinel with load bar but these are simply terrible with no load bars. The connectors are really good quality, so far no failures. The only drawback is the lack of a slide/guide - getting the wires properly inserted takes quite a bit of patience with the staggered design.